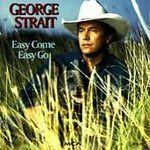 George Strait Easy Come Easy Go (Country) Artist: George Strait Release Date: 1993 Format: CD Record Label: MCA Records (USA) Genre: Country UPC: 008811090722 Sub-Genre: Mainstream Track listing 1. Stay Out of My Arms 2. Just Look at Me 3. Easy Come, Easy Go 4. I'd Like to Have That One Back 5. Lovebug 6. I Wasn't Fooling Around 7. Without Me Around 8. Man in Love With You, The 9. That's Where My Baby Feels at Home 10. We Must Be Loving Right Details Playing time: 31 min. Producer: George Strait, Tony Brown Distributor: Universal Distribution Recording type: Studio Recording mode: Stereo SPAR Code: DDD Album notes Personnel: George Strait (vocals, guitar); Steve Gibson, Brent Mason (guitar); Paul Franklin (steel guitar); Stuart Duncan (fiddle); Matt Rollings (piano); Glenn Worf (bass); Eddie Bayers (drums); Curtis Young, Liana Manis (background vocals). On his eighteenth album for MCA Records, George Strait remains the king of the back-to-basics approach to country music. He is credited with jostling country back to its roots, and creating a major market along the way. EASY COME, EASY GO's title track--co-written by Dean Dillon, composer of some of George's biggest hits--is a clever bit of songwriting, and could well be a pop hit. With a slight Latin lilt and a Spanish farewell, the song's doomed lovers work on an easy way to end heartbreak. Progressive- traditionalist singer/songwriter Jim Lauderdale provides two upbeat, tasty cuts: the opening, bouncy shuffle "Stay Out Of My Arms," and "I Wasn't Fooling Around," a playful song where Strait gets to stretch his phrasing around elastic lyrics and a rubbery melody. It's hard to believe these songs were written by Lauderdale in the '90s; they sound like they came from an old-time honky tonk's jukebox. Honky tonks are George's element, and his "That's Where My Baby Feels At Home," as well as the vigorous remake of George Jones' barroom classic "Lovebug," will get mugs sliding down bars at full speed. George gives it to you Strait: country music the way its supposed to be. Editorial reviews ...On his latest, Mr. Laid-Back has got it down to a proven formula... - Rating: B- Entertainment Weekly (10/01/1993) Portions of this page Copyright 1948 - 2008 Muze Inc. All rights reserved. THIS CD IS FROM THE JUKEBOX COMPANY WE USE TO OWN. IT'S NEW AND COMES IN A SLIMLINE JEWEL CASE WITH FRONT ARTWORK,OTHER THEN THE WAY WE STORE THEM IT IS THE SAME CD YOU WOULD BUY IN THE RECORD STORE.